The 4th of July comes again to America in 2017, and Gatlinburg for its fifth decade running leads the nation in its First Independence Day Parade, starting in the first minute of Tuesday the 4th, after the stroke of midnight of Monday night, July 3. This is the 42nd Annual Fourth of July Midnight Parade in Gatlinburg, Tennessee. This year, in honor of the countless local and regional heroes who came to the aid of Gatlinburg during the fires of 2016, the Grand Marshals of the parade will be firefighters, first responders and police officers who jumped into hazard without hesitation to save the town. 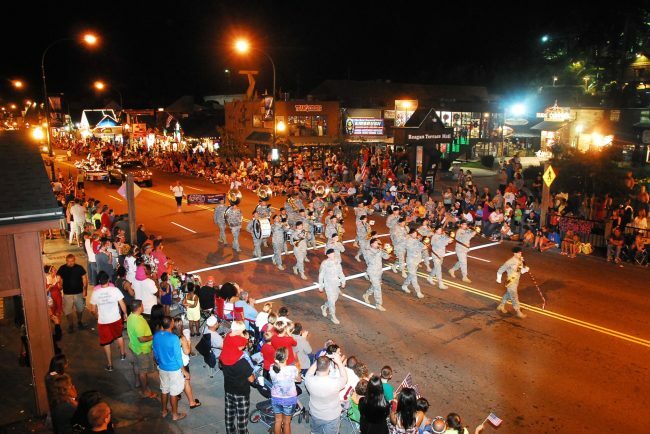 Gatlinburg’s Independence Day Midnight Parade is a star-spangled, high-stepping parade acclaimed with countless awards and recognition, including by National Geographic which lists it in the Top 10 such events in the nation. The parade has attracted up to 100,000 spectators lining Parkway, many of them settled in with camp chairs, blankets and supplies, having staked out good viewing spots earlier the day before. The parade starts at traffic light #1A on East parkway, turns south onto Parkway at Light #3, and proceeds the length of Parkway to Light #10, taking about an hour and a half. Parking is free or affordable at numerous places, and latecomers in the evening may do best to park along East Parkway and walk closer in. Good viewing is everywhere, but the best is around Lights #3 and #5 (Ripley’s Aquarium). The parade is a traveling entertainment show, with huge balloons and animated figures, as many as 100 floats with stunning decorations, marching bands, military units, organization groups, and a variety of fancy vehicles, walkers, horse riders and eye-catching entertainers. This year includes bands from as far away as the east coast, as well as regional participants. Clustered around the parade on the Monday and Independence Day itself are numerous events. On Monday as the crowds filter into Parkway, at 6 pm on Ripley’s Aquarium Plaza, the 129th Army Band will give a free concert. After the parade, and hopefully a little sleep, the big day launches events in Gatlinburg and Pigeon Forge, culminating in each town with a massive fireworks display – at 10 pm in Gatlinburg and at 9:45 pm in Pigeon Forge. It’s a time to choose where you’ll be. At 10 am in Gatlinburg, entrants can sign up for the annual River Raft Regatta, a light-hearted river race featuring almost anything that floats on its own, downriver through Gatlinburg, starting at Christ in the Smokies Bridge on River Road, and ending at the Aquarium bridge. It’s free to enter, and with several prize categories. The Regatta is a fun way to shake off the late night and ease into the day of celebration. Parkway will continue to bustle all day as visitors and locals enjoy the endless attractions of Gatlinburg. And Gatlinburg in summer has free trolleys up and down Parkway, and music on Parkway every evening with the Tunes and Tales street musicians and performers. At 9 pm the 129th Army Band gives another free concert – and then comes the fireworks show. Meanwhile Pigeon Forge is ready to go, and at noon in Patriot Park, the 26th Annual Patriot Festival begins for the kids with treats and a Kids Carnival, and launches formally at 1:30 pm for a day of free music, live bands, activities, and vendors with plenty of food. Parking is usually easy around the park, which is a lovely place to stroll around in, and there’s also a free shuttle from the free parking area at the LeConte Center. At 9:30 the Pigeon Forge festivities end and the fireworks show gets ready. It’s an acclaimed display that will provide a brilliant memory and perfect ending to the day for those in Pigeon Forge. And you can’t be everywhere, so if you’ve made it to Gatlinburg by 10 pm, and head towards the Aquarium, you’ll catch an awesome pyrotechnics show here too, also highly acclaimed and very dazzling. Word still needs to spread around the nation that Gatlinburg was NOT destroyed in the fires of last year, contrary to the general impression that people received across the land. Hopefully this year’s First Fourth of July Parade will go some way to reassuring the country that the Smoky Mountains stand strong and whole, and Gatlinburg is alive and marching!